Learning From the Saints | A blog by Br. Jesse T. Alexander IV, where we Learn about God through the Saints of the Church. I have a book review up at The Christian Manifesto. If you want to check it out here is the link. It was a pretty good book, but you can read all about my reactions there. I will hopefully be back to regular posting pretty soon, things have been a little crazy the last month. Today’s reading comes from Acts 19:1-10. In this passage St. Paul travels to Ephesus where he finds some disciples, who had only been baptized with the Forerunner’s baptism. Paul learns they never received or heard of the Holy Spirit. So he explains that St. John’s baptism was for repentance and they were baptized into the death and resurrection of Christ. Paul then laid hands on them and they received the Holy Spirit. These disciples then spoke in tongues and prophesied. Paul stayed in this region for three months preaching about the Way. Then he was pretty much kicked out and those who opposed him, talked against Jesus and the Way for two years after this, so everyone heard about the Lord. Now I am not one for re-baptizing people, because if it is done correctly once it is not needed again. However, this is one place where being re-baptized is correct because they were not baptized into the name of the Trinity or had the baptism of Jesus. They only had John’s baptism, something we do not have to worry about today. However, there are some churches that follow Luke’s exact wording in this passage and just baptize people into the name of Jesus. People who are only baptized into the name of Jesus can be re-baptized because we can and should follow the command of Jesus to baptize into the name of the Father, Son, and Holy Spirit (something Paul probably did here, but Luke just didn’t word it this way). But baptism is a sign of belonging to the Kingdom of God and once you are in, there is no need to try to come in again. Even if it was done while you were a baby or if you left the church for some time, God’s grace was still poured out on you in the waters of baptism and it does not need to happen again, even if might make you feel better. Paul also laid hands on the disciples and told them to receive the Holy Spirit. This is something that seems to be neglected in many churches today or over emphasized in others. The Holy Spirit and the gifts of the Holy Spirit were not just for the early church, but was sent to all the church throughout history. The laying on of hands is very important because it is a sign of the person having hands laid on him/her submitting to the will of the Spirit. This act of submission can make the person more receptive to the Holy Spirit, but we receive the Holy Spirit when we confess Jesus Christ. The laying on of hands and the prayers of Christians for the strength of the Holy Spirit, as we see in Paul ministry, can be very powerful. What happened in Ephesus can and does still happen today. It can also be a loosing of the other gift of the Spirit, be they wisdom, knowledge, faith, healing, prophesy, miracles, discernment, tongues, interpenetration of tongues, encouragement, evangelism, apostleship, shepherding, serving, giving, compassion, or administration. Sometimes we just have to get out of God’s way to allow him to work and confirmation or laying on of hands allows us to do this sometimes. Those who want to live out the monastic life, should take very seriously the idea to be hospital to guests. Giving them all that they require and more. In today’s reading St. Benedict wants their to be a separate kitchen for the abbot and his guests, so that if any arrive at irregular hours, the order of the monastery is not disturbed. It is important to receive guests but it is also important for the monk to keep on his path to God. When we receive guests we should welcome them and make them feel at home, but do not sacrifice the holiness of your house or your practices. If you pray the evening office, invite the guest to join with you, but do not forsake it, because of the presence of guests, they need the prayer as much as you do. Also see to their needs and if you can treat them to a special meal or give them the best portion of food. Break any fast that you might have for a guest, as it better show the humility of hosting a guest than keeping a fast. Next Thursday is the feast of St. Dominic, founder of the Order of Preachers. I am linking to a post that I made for the Feast last year. I hope you like it. I don’t have much else to say about St. Dominic that I didn’t say there. So here is the post enjoy. I have been thinking about what Spiritual Formation is for the last few weeks. Next week I will be starting a book discussion on Spiritual Formation Thursdays. But I wanted to also talk about what Spiritual Formation is, because I think this book will be good to read in a Spiritual Formation mindset. I ran across this quote from Life in the Spirit: Spiritual Formation in Theological Perspective eds. Jeffery P. Greenman and George Kalantzis: “Spiritual Formation is our continuing response to the reality of God’s grace shaping us into the likeness of Jesus Christ, through the work of the Holy Spirit, in the community of faith for the sake of the world.” The quote comes from the essay “Spiritual Formation in Theological Perspective: Classic Issues, Contemporary Challenges,” by Jeffery P. Greenman. I really like this quote, because unlike a lot of other explanations of Spiritual Formation I have seen, it has a Trinitarian format. While Spiritual Formation’s goal is to shape us into the likeness of Christ, it is not done in a vacuum. We must, first, respond to God the Father’s (I would have liked to see Greenman make the distinction that “God” is “the Father”) grace, beyond just the response of working toward sanctification and salvation, as we are not saved until we actually meet God face to face and he saves us. This sanctification and salvation process shapes us into the likeness of our Lord and Savior Jesus Christ. But we are not just responding and grace is not just shaping us into Jesus, on its own, the Holy Spirit must work through us to do this; we must also be seeking the Holy Spirit to allow his work to fully penetrate our lives and beings. Likewise we must, also, be seeking a community of faithful people to encourage us to grow into Christ-likeness. All this is also done not for our own personal growth, but that we might be changed inwardly, to go out and shine the Light of Christ into a dark world, so that more might come to a saving knowledge of God. While I like Greenman’s definition, I would place a lot more emphasis on the role of the Holy Spirit in Spiritual Formation. Since the Spirit’s role in the world and in our life is to reveal the Father and the Son to us, through the Bible, good works, the sacraments, and prayer. I would also, define the “community of faith,” as “the catholic church;” making it a more specific community of faith since, the church is the community that Christ established. I am not saying that para-church organizations cannot help with Spiritual Formation, sometimes they do a better job than the church; but the sacraments and spiritual authority were given to the church, not just a/the community of faith. Today’s reading comes from Mark 6:47-56; it is about Jesus walking on the water. But it is from Mark’s Gospel (which Tradition states St. Mark wrote down what St. Peter said/preached), so with St. Peter trying to be humble-we suppose-Mark left out the part about Peter walking on the water too. But there is still plenty to learn even from this shortened story. In it the disciples are crossing the sea and there is a storm. Jesus stayed behind on the land. Sometime into the night he saw the disciples struggling with the wind and a storm, he walked out on to the sea and intended to pass them. But when they saw him, walking on the water-which they knew people didn’t do-they got a little freaked out and thought he was a ghost-a logical explanation for why a human looking figure would be above the water. When Jesus saw them freaking out he went over to them, told them to calm down and identified himself, and got in the boat. When he got in the boat the wind stopped. I am going to guess the disciples were still a little freaked out and since people don’t usually walk on water, they didn’t understand how he did it. Then they got across the sea and Jesus went about healing people. Almost everyone comes down on one of two sides with this story. 1) There are those who berate the disciples for freaking out and not thinking or knowing that Jesus could walk on water or do whatever he wanted. This is pretty much the look at the dumb disciples, they had so much to learn approach. Usually said from someone who has the benefit of knowing the Gospel story before reading the story and usually believing Jesus is God before reading the story. 2) The other side is the give the disciples the benefit of the doubt side. These readers understand and remember the disciples, didn’t really know Jesus was the Son of God, the Second Person of the Trinity, or that he could pretty much do anything he wanted because he God. They try to put themselves in the sandals of the disciples and understand they have a lot more theological training or knowledge than the disciples did. I probably fall more on side 2. But I can understand side 1 because the disciples have seen a lot of stuff and they just saw 5,000 men get feed from very little food. But that type of miracle had happened before, Elijah gave a woman a jar of oil and flour, that didn’t run out until there was rain in the land. So multiplying food was something they had seen before, never before had they seen or heard of a prophet, messiah, or miracle worker walk on water! This was some pretty wild stuff and totally new for them! How many of us wouldn’t freak out if we saw someone walk on water. Heck that Criss Angel, guy, did it one time in Las Vegas at a pool and people were freaking out, granted they were actors and getting paid to freak out. So which side do you fall on, 1 or 2? After Constantine legalized Christianity and there was a large influx of people into the Christian religion; there was the need for official theology and a development of the theology already in place. Emperor Constantine tried to facilitate this development of an official theology, because he understood the need for order within the Church. One way he tried to help with this was by convening a meeting between all the bishops of the Church at the time; this was known as the Council of Nicea. The Council of Nicea met in 325. The Council met to discuss several issues, one of which ended up taking over most of the meeting. On the schedule was the date of Easter, the Meletian schism, the validity of baptism by heretics, the status of the lapsed, discuss canon law, and to discuss the theology of the priest Arius. Once the meeting was underway, Eusebius of Nicomedia stood up with 22 other bishops to read the theology of Arius. Some of the bishops who had supported Arius changed their mind when they actually heard the theology read. However, some bishops still supported him and the arguments went on for two to three months. At one point Arius himself was brought in to defend himself. Nicholas of Myra was so offended by Arius’ statements on the divinity of Christ, that he actually slapped Arius across the face. He had his bishops robes striped from him and was put in jail. That night in a dream Jesus and Mary appeared to Nicholas asking why he was in jail. He replied he was in jail, “Because of my great love for you.” At this Jesus gave him the Gospel book and Mary gave him bishop robes. He was released the next day at the command of Constantine. At the end of the Council, the Arians were defeated, mostly; their beliefs lived on and would have to be dealt with for years to come. But the orthodox Church, had an answer to the problem of the Arians, they came up with a creed (professing the beliefs of orthodox Christians). This was known as the Nicene Creed (which is different than what we call the Nicene Creed today, it is less developed). Many believe the Creed was developed by Eusebius of Caesarea, the bishop of Caesarea and Palestine, based on the baptismal creed from his diocese. At the end of the meeting Constantine decreed that anyone who did not agree with the Creed would be exiled. Arius and two bishops did not agree with the Creed and were thus, exiled; however, several bishops endorsed the creed, but stated their disagreement with certain parts. The biggest example of this can be seen in Eusebius of Nicomedia, who was Constantine’s cousin and bishop; who swayed the Emperor away from the orthodox bishops to the Arian stance. After Constantine there were two Arian Emperors. The Nicene Council set the precedence of the Ecumenical Council of the Church, when all bishops would gather together in one place to decide the important issues of the Church. There have only technically been seven Ecumenical Councils (although some churches will say there were more or less, these other councils were either only regional or only involved one church, such as the Roman Catholic Church). At many times theology would be developed or approved in the Ecumenical Councils and debates would be decided. Of course most theology would develop outside the Councils and would be accepted by the Church as it spread to different areas, much like the canonization of the Biblical texts. Most of the time a bishop or priest would write a letter or a book and explain how they understood some theological principle. These books or letters would be passed around and bishops would agree with the writings and would copy the text, thus preserving them. Ones that were not agreed with would not be copied or would have responses pointing out the problems and these responses might get copied, thus preserving them, and the Church’s theology would grow from this too. If it needed to be dealt with like the Arian controversy it would, but usually in local synods, not Ecumenical Councils. In these ways the Church developed her theological stance on issues and developed how it understood the Triune God. I have previously talked about the Liturgy of the Hours (you can find that post here), but in this post I want to talk about prayer more generally. All monks and nuns pray. It is the most important thing that they do. They do other things of course and many of the other things they do are very helpful and meaningful, but none are as important as prayer. A Franciscan Friar might feed the hungry, cloth the poor, or preach to the downtrodden; but he does nothing unless these actions are focused through the lenses of prayer. A Benedictine nun might teach children, write a book, or encourage others on the spiritual path; but unless she starts every day and action with a time devoted to God in prayer, none of these actions will produce a harvest of one hundredfold, sixtyfold, or thirtyfold. These actions even without prayer are good actions and can be seen as an act of prayer/type of prayer. I am simply trying to show how important a dedicated time of prayer is. Some Christians might criticize monastics for praying the liturgy of the hours, without understanding that monks and nuns, pray these hours in addition to their personal prayer time. The liturgy of the hour is simply a way to call the monastic back to prayer throughout the day. Reminding them to pray on their own throughout the day, but at times when they might get caught up in other rhythms; the bells ring and they stop their work and walk to the chapel to turn to God. After they leave they go out remembering God and saying prayers in their heart until they are lost in work or thought, and then are pulled out again by the ringing of the bell. Some masters might be able to split their attention between their work and prayer. Or they might constantly have a breath prayer on their mind or passing through their lips. But all of us are beginners on the path of prayer, some might be further along, but we are all beginners and most of us are constantly starting again, down this path. True masters of prayer are those who never rest too long on the side of the road. Many of us will at some point get to where the path is too hard to continue on and will be unable to move on to different types of prayer, and will have to stay where we are. While we are there we can look off to see some further along the path and might be able to make out little pieces of their encouragement or instructions and this might be enough to get us a little further on the path, or it might sound too foreign to us or we might be unable (for several reasons) to put their advice into action. Sometimes we might find a person who has gone further along the path but has come back down to help or lead others along the path, these great men and women are wonderful and are truly saints, for they long to see others have what they have received. They want to see others experience the beauty and love of God. We could think of them as a woman in a wedding dress, before the wedding service is about to start, seeing a child fall in the mud and disregards her dress and the service to crawl into the mud to comfort and help the child out of it. The groom of course has no regard or concern for the dress, because he sees what kind of mother his bride will be and is proud of her for helping the child. I believe this is the way Jesus sees those who travel back down the path to help others along the path. Others have described this as those who stand at the door ushering others through, after they have already been through the door and have come back through to help others. So the point is monks pray and some of them come back down the path to help us but all of them walk along the path and cannot help but pray, both in the liturgy of the hours and in their private personal prayer time. 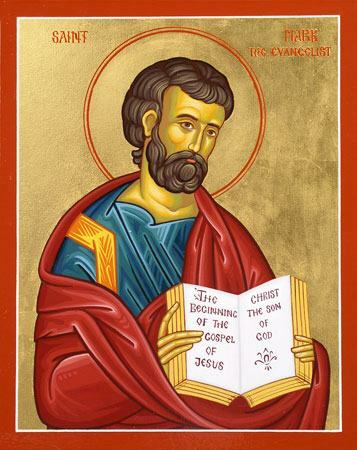 Next Thursday (April 25th) we celebrate the feast of St. Mark the Evangelist, author of the Gospel According to Mark. Mark’s Gospel is thought to be the first of the Gospels written, which Sts. Matthew and Luke used as the framework for their Gospels. Little is actually known of Mark, but he does appear in the Acts of the Apostles and he is mentioned in two of St. Paul’s letters. Mark was present for many events of the early church. After’s St. Peter’s miraculous escape/rescue from prison in Acts 12 he went to Mark’s mother’s house, where several members of the church were gathered to pray. Mark also accompanied Paul and Barnabas back to Antioch after they brought the gift from Antioch to the churches in Judea. Mark also joined Paul and Barnabas on their first missionary journey, but left them early, returning to Jerusalem. When a second missionary journey was purposed Barnabas suggested they take Mark with them, but Paul thought he was unreliable. The disagreement was so sharp that Paul and Barnabas went on their own journeys, Barnabas taking Mark and Paul taking Silas. Mark makes no other appearance in Acts. Paul does, however, mention him in his letter to the Colossians, naming him as a fellow Jew and worker for the Kingdom of God. In his second letter to Timothy, Paul says, Mark is very useful to him for ministry, and asks Timothy to bring Mark with him when he comes to him. Peter, in his first letter to the Church, mentions Mark as his son. It is probable that he means son in the spiritual sense here. Papias a Christian writer from the 2nd century states, Mark acted as Peter’s interpreter. He also says that Mark wrote down what Peter said (not in the same order), thus composing the Gospel. So it is likely that Mark also traveled with Peter for a time, probably near the end of Peter’s life; since Mark was with Peter in Rome when he wrote his longer letter to the Church. There are rumors surrounding Mark as well. Many believe that Mark might have been present at the arrest of Jesus as the boy, clothed in a linen cloth, who was disrobed when trying to escape capture. This is believed to be Mark because who would know this detail about the arrest, and include it in the story other than the person to whom it happened? Tradition says after Peter’s death Mark left Rome and traveled to preach in Alexandria and Egypt and eventually suffered martyrdom. In the Church Mark’s Gospel is usually associated with a lion. Based off the four living creatures around the throne in Revelation (lion, man, ox, and eagle). Mark is associated with the lion because it starts with John the Baptist crying out in the wilderness, much like a lion roaring. This has been applied to the Gospels as early as the 800s if not earlier. The Church views Mark as a saint because he wrote about the life of our Lord Jesus and lived out a life devoted to our Lord Jesus. His idea to write down the life and miracles of our Lord, based on the preaching of St. Peter was the first of its kind. His Gospel Gives the Church a solid starting point for the remembrance of our Lord’s deeds and actions. The Gospel ends at the perfect place to start preaching and teaching about the Lord’s Resurrection, almost as if it was meant to be read to a group by someone already a Christian to continue the teaching at the end of the book, allowing someone to actually preach the good news to a crowd instead of just reading it (Note: I am referring the earliest manuscripts which end at Mark 16:8). Prayer: Almighty God, awaken in us a love for the story of the life of your Son, our Savior, Jesus Christ. Allow us to take from his preaching and miraculous deeds, a sense of awe and the scope of your power. Give us hearts that want to explain your great love for the world to others, as you gave your servant St. Mark. Allow us to like him explain the life, Passion, and Resurrection of your Son to all those we meet, who need to hear about your great love for them. We pray that you would send to us the same Holy Spirit who directly Mark’s mind, mouth, and hand in composing your story. We ask this through your Son, our Savior Jesus Christ who lives and reigns with you and the Holy Spirit, now and forever. Amen. This practice is a very difficult one to just sum up and put a neat little bow on, saying this is how you do it go have fun. This looks different for each person; it is the process of changing everything in your life to reflect the majesty and glory of God. It is each day trying to choose the option that makes you look more like Jesus. It is positioning yourself so that the Holy Spirit moves through you into the lives of those around you. It is a way of life that invites the Godhead into yourself, to change you and shape you, so that your actions reflect the work and service of God. This idea of Conversion of Life has been debated over the last 50 years or so, some believing that it was merely St Benedict’s way of saying be conformed into the life of a monk, taking on chastity, obedience, and poverty. But as “simple” as the Rule is, I do not think our father made it that simple. I think he wanted the monk to change his life not to conform to the Rule or the life of the monk, but to the life of God. The life of the monk is to focus on God, an ordered life helps with that, but having an ordered life is not the goal of the monk. Just as much as having a kid, did not make me a dad, it made me a father. Playing with my daughter, getting down on the floor, teaching her, changing her diapers, caring for her, those things make me a dad. It is the same for the monk, saying the Psalms, wearing a habit, or living in a monastery does not make someone a monk. Praying the Psalms, being obedient, loving God, showing love and hospitality in the monastery, and changing your whole life around make one a monk. So how do you convert your life to allow more room for God? I am not sure how you do it, for me, it is prayer, daily listening/contemplative prayer. Being active in church, serving in the church; praying throughout the day; and reading the Bible daily, these are some ways that I find converting my life to let God fully move through me. So really I think the way to practice Conversion of Life is a hit and miss process, trying to find what works for you. If Lectio Divina really works for you, then do it. If you cannot really do contemplative prayer without losing focus, then do not practice it very often. Question: How do you allow God to move through you?